Arlington National Cemetery, Ingersoll grave site. Georgetown University Library, Ingersoll Collections in the Manuscript section. Library of Congress, Madison Building, manuscript Division, Room LM101, and the photo Division. Ingersoll’s papers are available on microfilm. 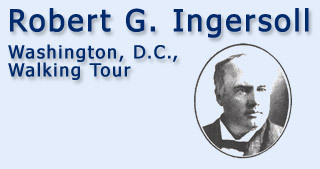 Ingersoll’s voice is on a phonograph record that may be heard in the Library of Congress Music Division by appointment. 7. The truth is, our government is not founded upon the rights of gods, but upon the rights of men .... It is the only nation with which the gods have had nothing to do. 8. Happiness is the only good.